You ever look at your own hair like, "wow...that's ME?!" Ummm...yeah. That's me right now. Okay, so... I'm gonna come right out and say it. Tell 'em why you mad, C! I'm mad because alllllllll this time, y'all left me hangin' in these natural hair streets. It's like, all y'all knew that Mielle Organics Babassu Oil Mint Deep Conditioner and Moisturizing Avocado Hair Milk were ridiculously off the chain, but y'all couldn't be bothered to let a sista know. I mean, dang. Saltiness aside, I'm super thrilled that I got the opportunity to try the Mielle Organics Babassu Mint Oil Deep Conditioner and Moisturizing Avocado Hair Milk because they are straight FIYAH. Like, don't make no sense. 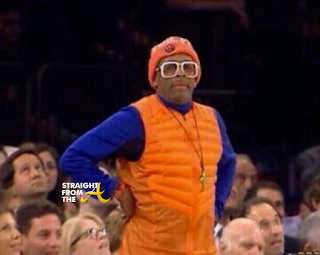 You ever stood up and looked at your hair products like this? That's pretty much how I feel about Mielle Organics right there. Like first of all, I'm mad I just found out. Second of all, how DARE you be that bomb?! And third, look at my hair! Before I continue rambling or resign to a string of yassssssssss-es, let me get on with this review. Fun times ahead: watch the video while you read! Or, watch the video and don't read. Just click something! Lol! Click here to shop Mielle Organics at Target! Babassu Nut Oil: Oil pressed from the kernel of the Brazilian Orbigynya Palm Tree, with a similar chemical composition to coconut oil. It is able to penetrate the hair (to a degree), improving moisture, strength, elasticity, softness, and shine of hair. It is a wonderful alternative for those who want the benefits of coconut oil, but don't care for it in the hair. Biosaccharide Gum-1: Moisturizing, soothing ingredient made from the fermentation of plants. Creates a moisture-binding film on hair and skin that leaves both feeling smooth, soft, and velvety. Acai Pulp Oil: Powerful, antioxidant rich oil that revitalizes the hair and fights signs of aging and damage. Proteins are made up of chains of amino acids. The cuticle layer of the hair (we've talked before about how the cuticles lay like shingles on a roof) contain the highest concentration of amino acids. The cuticles of the hair are responsible for everything from porosity and strength, to moisture retention and how the hair behaves (or curls). According to Science-y Hair Blog (linked above), glutamic acid, proline, valine, and cystine are very prevalent on the outer layers of the cuticle, and epicuticle, helping to keep the cuticle layer healthy and strong. 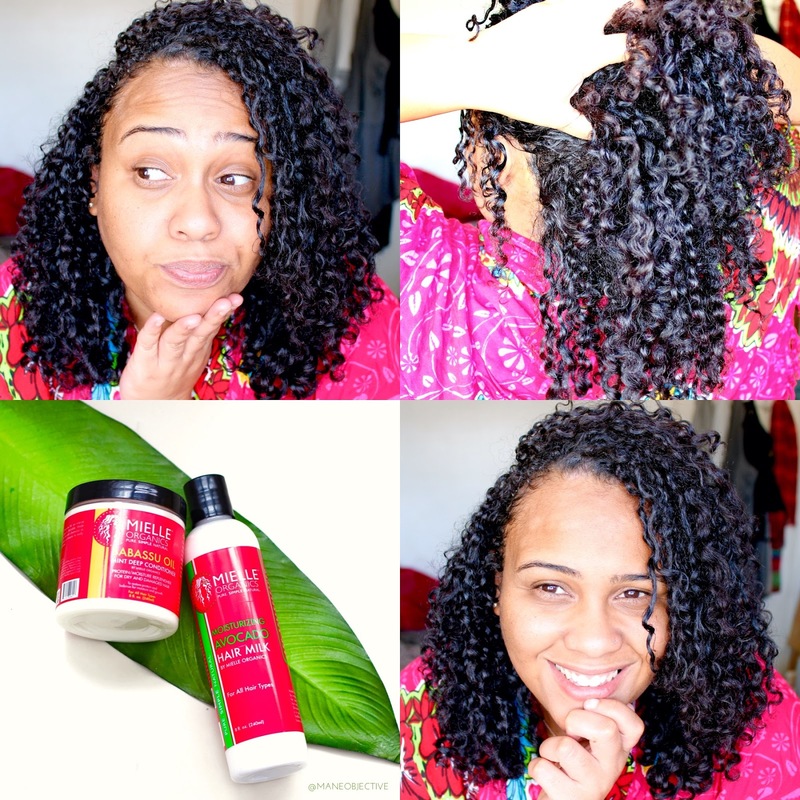 In deep conditioners like Mielle's Babassu Oil Mint Deep Conditioner, amino acids help damaged hair restore normal porosity by improving the sealing ability of the cuticle layer. Aminos also strengthen and moisturize the hair, as they attract water. According to studies (hi again, Science-y Hair Blog), histidine, phenylalanine, and arganine improved the strength of the hair. Glutamine has been shown to help promote healthy hair growth. So to wrap this thing up with a neat little bow, the deep conditioner contains elements of proteins that help strengthen, restore the cuticle layer, balance porosity, and stimulate growth. Ohhhhh my God YES! Can we just go ahead and call the Babassu Oil Mint Deep Conditioner exactly what it is? A blessing in a jar. Absolutely. 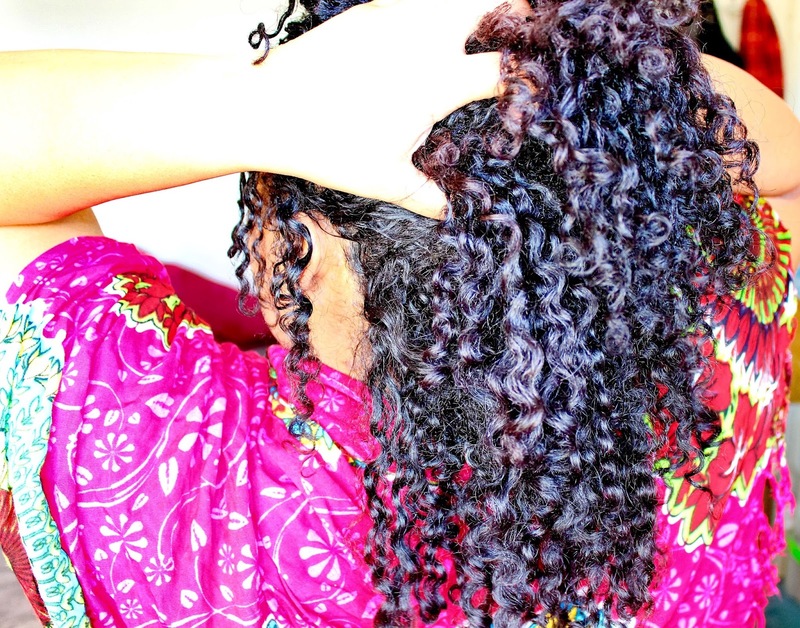 Deep conditioners make me emotional, and this one is no exception. I absolutely love how bright and invigorating the fragrance is - it reminds me of a citrus herbal mint tea. It truly is brightening. It lingers in the hair (I smelled it hours after I had rinsed and done my wash and go), but it's not pungent, sour, or gross. It's cheery. I like it. Like I said in the video, the fragrance will either draw you or drive you. It drew me innnnnnn! The consistency isn't as thick as most deep conditioners are, but that had no impact whatsoever on it's potency. My hair soaked this stuff up and smiled! After deep conditioning, my curls are suuuuuper soft, extra hydrated, ridiculously shiny, and all kinds of smooth. Curls? POPPINNNNNNN! Oh, and how could I forget to mention the SLIP?! Lawdamercy, the SLIP! You guys know I have high standards when it comes to deep conditioners. The slip on this stuff is off the chain, and makes it suuuuuuuper easy to keep hair detangled during deep conditioning and in preparation for styling. See? Blessings on blessings on blessings. I only have two issues with this product: one, I just found out about it in 2016. Two, it only comes in 8oz. Team Mielle, we need more! The people need 16oz! I mean, I need a salon sized 33.8oz bottle but.... hey. Maybe I'm just being selfish. Real talk, like, all theatrics and extra-ness aside, the Babassu Oil Mint Deep Conditioner is 100% dope. All the way around. I say time and time again, if your deep conditioner isn't keeping tangles, splits, knots, breakage, and dryness at bay - then you need a new deep conditioner. And I'm just gonna go ahead and put this out there right right now... the Babassu Oil Mint Deep Conditioner will be on the Christina's Choice 2016 list. I already know that for a fact. So when I say this deep conditioner is EVERYTHING and then some, believe me. Click here to shop at Target! Aloe Vera Gel: Acts as a natural conditioning agent that restores the hair's sheen, luster, and shine. It not only makes the hair soft, but it also enhances strength and suppleness. Cetyl & Cetearyl Alcohol: Considered "fatty alcohols" -- NOT to be confused with drying alcohols such as ethyl. Acts as a lubricant, thickener, and emollient. Also gives conditioner its velvety feel without making hair greasy. Is additionally used to keep product ingredients from separating. Organic Avocado Oil: Omega 3-rich nourishing oil extract that can enhances shine, moisture retention, softness, and elasticity in hair. No. Contains hydrolyzed wheat protein. Annnnnd the blessings don't stop. You guys know I don't get excited much about moisturizers and hair milks. But when I find a good one?! Pshhhhhhhhh! I absolutely adore every single thing about the Moisturizing Avocado Hair Milk. The consistency is perfect. The slip is amazing. It intensely moisturizes without leaving my hair greasy. It provides brilliant, non-oily shine, and keeps my curls moisturized for days. So what's good about this product? Everything. I love it as a leave-in, I love it as a moisturizer and refreshing product. I love it here. I love it there. I love Mielle Organics, I love green eggs and ham. Lol.. that's the delirium setting in for sure. Just know that the Mielle Organics Moisturizing Avocado Hair Milk is amazing. I tried really, reeeeeeeeeeally hard in this video to come up with something I didn't like about the Moisturizing Avocado Hair Milk. I got nothin'. Certified dopeness. Are you seriously still reading this?! Get yourself on over to MielleOrganics.com and get you some. Like, yesterday! In a heartbeat. So ummm.... who got that Mielle Organics affiliate code one time? Hook a sista up. 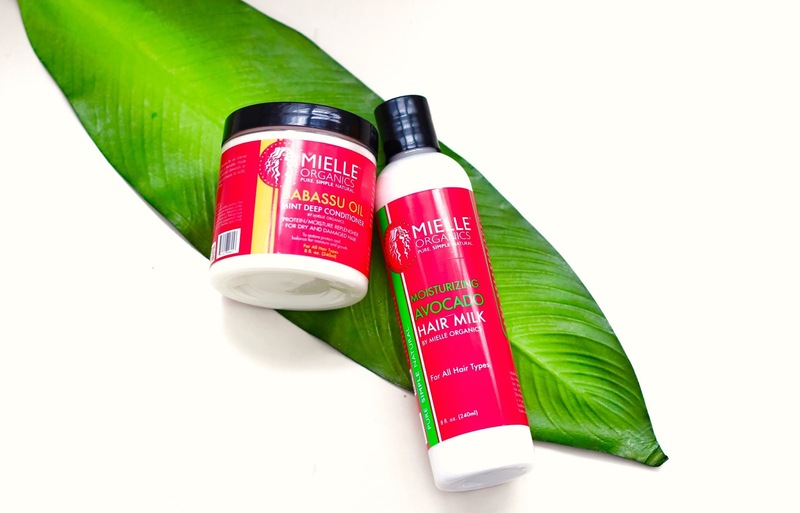 Have you tried Mielle Organics' Babassu Oil Mint Deep Conditioner or Moisturizing Avocado Hair Milk? Let me know how you liked them in the comments below! I felt the same as you when I tried it. Where have you been all my natural life! I subscribe to the Curls Understood box, they turned me on to this excellent conditioner and other great brands. Thank you! I'm glad I'm not alone lol. I can NEVER run out of this stuff! Love love love!!! Especially the hair milk! I can skip their leave in and buy extra milk! Their co wash and shampoo are pretty good too! Now THE KIDS VITAMINS,. 😍😍😍 MY DAUGHTERS HAIR GREW SO MUCH! OMG I need the adult vitamins! Or the kids ones. Lol! I just came across your blog and I absolutely love it. Awesome reviews. I can't wait to read and catch up on your posts. keep up the good work. What styling products did you use wth it? Great review. I love all your reviews so funny and informative. I wanted to try this conditoner because it said moisture and protein balance. My haiir does not like protein, i have tried all kinds. They sell this brand at sally's if you have one around you. Since you said it has the amino acids in it i will try it.